(Davis, CA — November 21, 2007) New Breed Software is proud to announce the release of version 0.9.18 of Tux Paint, the Open Source drawing program for children. Over 50,000 colors are now a click away. Tux Paint 0.9.18's color palette now includes a rainbow-colored button which brings up a color picker. The colors available for painting have expanded from less than twenty to over 50,000! And now, pictures can have any solid-colored background. The background colors — along with the "Starter" template images that ship with Tux Paint (which previously appeared in the "Open" dialog) — are available from a dialog that now appears when starting fresh via the "New" button. Drawings can have any background color; 'Starter' templates have been moved from the 'Open' dialog. "Magic" tools, the special effects in Tux Paint (such as blur, smudge and grass), have been removed from the core of Tux Paint and made into "plug-ins" which are loaded into Tux Paint when it is launched. A programming interface has been developed and documented, allowing anyone to easily write new "Magic" tools for Tux Paint. 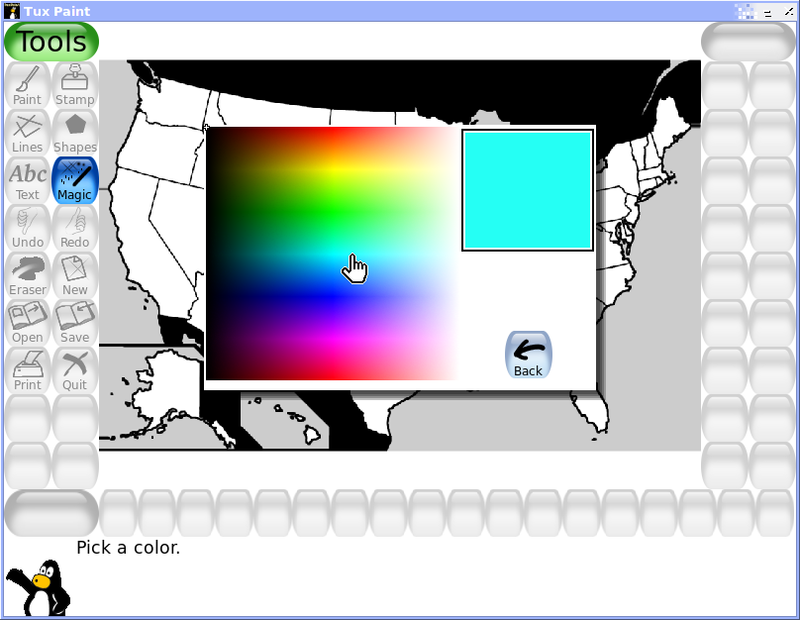 One goal of this new capability is to turn Tux Paint into a platform for teaching computer graphics programming to novice programmers, such as high school students. Many more Magic tools have been added. 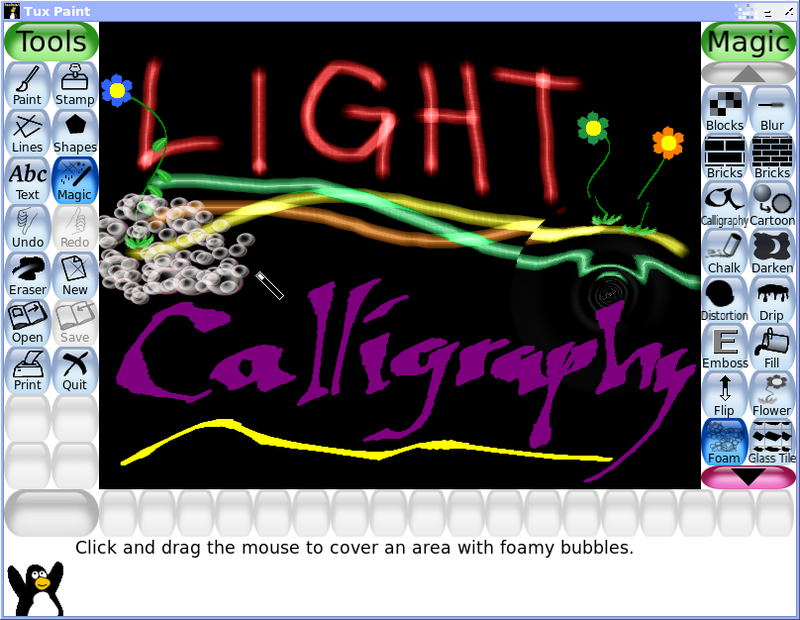 Writing new "Magic" tools for Tux Paint is now so much easier, a dozen new ones have been added, including a calligraphy brush that changes thickness depending on how fast you stroke, fun tools for adding flowers, foamy bubbles, and water ripples to pictures, a kaleidoscopic paint brush for drawing symmetric artwork, and a drawing tool that colors additively (like beams of light), rather than subtractively (like paint). The powerful Pango text rendering system is now used on systems that support it, providing vastly improved display of complex languages such as Arabic and Telugu. This version also introduces translations to Esperanto, Ojibway and Wolof languages. Following up the previous release's debut of "Input Method" support, the latest version adds support for entering text in Thai and Traditional Chinese. Tux Paint 0.9.18 is available immediately for Microsoft Windows Vista, XP and 2000, PowerPC-based Apple Mac OS X systems, Fedora Linux, and as source-code. Versions for Intel Macs and older versions of Windows follow in the coming weeks. 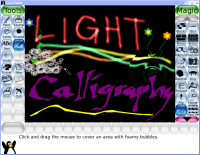 Tux Paint is available for download free of charge from the project's website. For further information, visit: www.tuxpaint.org and www.newbreedsoftware.com. To learn how you can help, visit: www.tuxpaint.org/help.